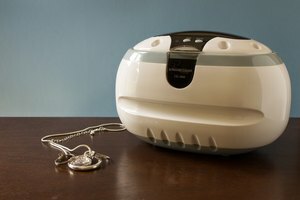 Ultrasonic jewelry cleaners vary in terms of bells and whistles -- some feature dual tanks, built-in drying racks and tweakable speed settings -- but they all rely on the same basic principle: Once you fill the gizmo with water and turn the heating element on, high-frequency ultrasonic waves ripple through the water to cleanse your jewelry. While basic operation remains somewhat standard across devices, consult the manufacturer-provided user manual for detailed instructions on your particular make and model. Place the ultrasonic jewelry cleaner on a dry, stable and level surface, and plug it in to a nearby electrical outlet. Fill the cleaner's tank with cool, clean tap water. Often, a fill line marks the proper fill level. 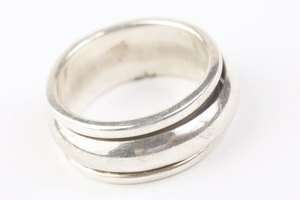 Add an ultrasonic cleaning solution -- available from the manufacturer or your local jeweler -- in the amount recommended by the machine's manufacturer, if recommended at all. Typically, these solutions are nontoxic, gentle and biodegradable. 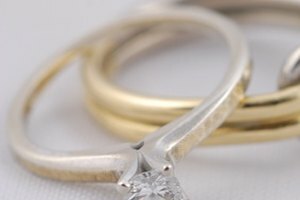 In some cases, the manufacturer only recommends additives if your jewelry needs heavy-duty cleaning. Place your jewelry in the ultrasonic cleaner's basket and put the basket in the tank. Consult the cleaner's user manual for a list of metals and stones that are safe to clean. If your cleaner has specific places for certain types of jewelry -- for instance, a watch rack or ring stand -- place the jewelry on these specific stations. Close the machine's lid. Set the intensity level, if applicable. 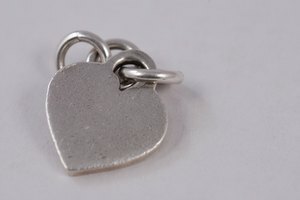 Generally, ultrasonic cleaners should be set to a low or medium intensity level for cleansing jewelry. Set the cleaner's timer, if it has one. You only need to clean your jewelry for 1 to 5 minutes at a time. Press the device's “Start” button or the equivalent to start the cleaning process. Open the lid and transfer the basket to the rinse tank, if you have a dual-tank ultrasonic cleanser, after the timer expires. Close the lid once again and set the device to rinse for at least a minute, or as recommended by the manufacturer. Turn off and unplug the cleaner, remove your items and carefully pour the water out once the cleaning cycle is complete. Set your jewelry on the cleaner's drying rack, if it has one, or dry it thoroughly with a soft, clean and lint-free cloth. Wipe the tank dry with a cloth and allow the unit to air-dry completely before storing it. To prevent damage to your jewelry and your machine, do not use ammonia or other harsh, flammable, non-biodegradable or toxic cleaning additives. Ultrasonic cleaners are usually not recommended for washing soft gemstones such as emeralds, opals and pearls. Check your user manual for detailed dos and don'ts. Always read and follow any instructions or warnings provided by the manufacturer of your ultrasonic jewelry cleaner before using the device.